Palais is designed very intricately in rich, tonal colours. Muted and toned down base colours make way for a more vibrant main colour to give a modern vintage appearance. 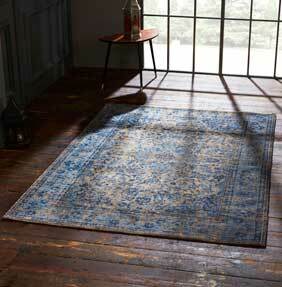 Each rug is made from the silkiest chenille mixed fabric which is expertly woven. Palais rugs are made in Turkey by master weavers, the delicate process required to make these rugs is visible in every single rug. A true talking point and centre-piece for any room in the home. Palais rugs also have the added bonus of been stain resistant so you can be assured this work of art retains its timeless beauty for many years. Capable of withstanding most substances from oil based substances to wine, tea or whatever we spill or drop, you’ll still have the added assurance this rug will retain its original looks.